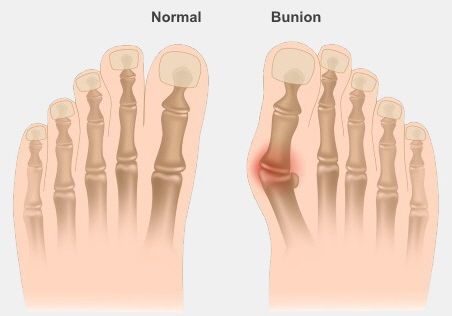 A bunion is an enlarged bone at the base of your big toe, caused by the joint being misaligned. Technically, the misaligned position of your big toe is called hallux valgus while the enlarged joint is the bunion. But most of the time the two go together and are simply called bunions. Bunions are usually caused by a combination of the feet you were born with, and badly fitting footwear (usually shoes with a narrow toe). As your big toe bends towards the others, this lump becomes larger and the bunion can become painful. You may also have some redness or swelling around the joint, and eventually you can develop arthritis and stiffness. Bunions can also follow foot injuries and trauma. People with flat feet or inward-rolling (pronated) feet seem to be more likely to have bunions. Some activities, such as ballet, put added pressure on the joint, increasing the chance of a bunion. You might also get corns and calluses on the bunion, your big toe and second toe, caused by altered pressure from footwear. You are also more likely to get an ingrown toenail. How your bunion is treated will depend on how bad it is, and what's causing it. Bunions almost always get larger and more painful with time, however you can help to slow down the progress. Cut back on anything that makes the pain worse, such as running and walking. Wear lower-heeled shoes. Shoes that are snug and supportive around your heel but wide around your toes are best. Running shoes (trainers) are ideal. Change the way you lace your shoes. Don't put the laces through the bottom eyelets – start the lacing from the next hole up and leave the bottom hole free. This gives you more room around your toes. Watch a demonstration on YouTube. Avoid any shoes that make the pain worse. Buy some foam or gel bunion pads for extra cushioning (you can get them at a pharmacy). Manage any medical conditions – such as diabetes, gout, or arthritis – that might make the pain worse. supplying orthotics to help support the joint. Even though you can manage any symptoms without surgery, surgery is the only way to get rid of a bunion. It usually involves correcting the angle of the joint. Talk to your doctor or podiatrist about being referred to a foot surgeon or orthopaedic surgeon. There is only very limited access to foot surgery through the public system, so you may choose to see a private orthopaedic surgeon. Written by Podiatry NZ. Adapted by HealthInfo clinical advisers. Last reviewed August 2016.